We Have Even MORE money! Great news! We have even more money to give away than we thought! This year the Mass Cultural Council is giving us $8,390 to give to you, so make sure to get your grant applications in! We’re giving away $7,430 again this year and you have till October 15 to get your grant application in! This year we’re looking for people to THINK BIG! You can read more about our local parameters and download application forms here. You can also pick up application forms at the Office of the Mayor, Greenfield Town Hall, 14 Court Square or at the Franklin County Chamber of Commerce, 395 Main Street. Apply now and tell your friends! Great news! 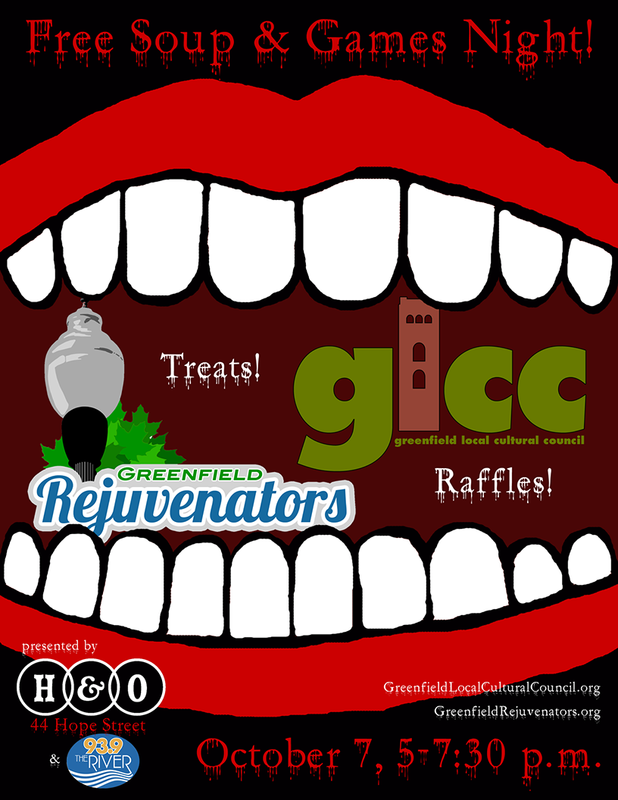 Hope & Olive has generously invited us to share a Free Soup & Games Night fundraising event with the new downtown beautification group, the Greenfield Rejuvenators. Come on down to Hope & Olive on Monday, October 7 from 5 – 7:30 p.m. for free soup, bread, and fun! There’ll also be tasty treats for sale, cash bar, and raffles galore. Plus, since it’s the October Soup & Games, we have a great excuse to get dressed up, Halloween-style. Come join us! 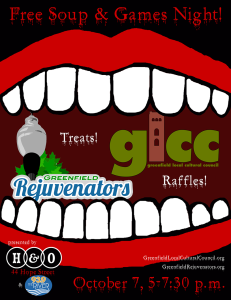 We’ll have grant applications there and GLCC members will be available to talk about the grant process. Don’t forget, the deadline for grant applications is October 15! The One Minute Festival Greenfield, a GLCC grant recipient, will take place on Friday, October 18, 8 p.m., at the Greenfield Garden Cinemas in downtown Greenfield, MA as part of a larger weekend of fun including the Double Take Fringe Festival and the Greenfield Annual Word Festival. The OMFG is a festival of one-minute short films created by you! All are welcome to participate – all ages and skill levels. Please contact your local public access station for information on how to create your own short. Cameras are nearly ubiquitous; you are invited to film an action, idea, or abstract imagery lasting close to one minute long. The organizers will do their best to include all of the videos submitted. Everyone can bask in the glory of watching their short videos on the big screen, projected in HD. Come one, come all to this amazing event! To submit your One Minute Video Join the OMFG Vimeo Group. You can follow the OMFG on facebook. The Nave Gallery in Somerville has several calls for entries and you don’t need to be a Somerville resident to enter. You can read more on their website. Thanks for contacting us, Nave Gallery! All you folks who were coming to the Master Plan Community Workshop this Saturday – we decided not to play chicken with the impending storm so the Workshop will be rescheduled. You can look for updates here, on the Master Plan facebook page, the Town page, or the main Master Plan page. The event WILL happen and we DO want you to come, so check back soon! You may have heard that we’re expecting some snow this weekend. The Master Planning Advisory Committee is watching the forecast carefully and will be making a decision by Friday afternoon about whether the Community Workshop this Saturday has to be postponed. 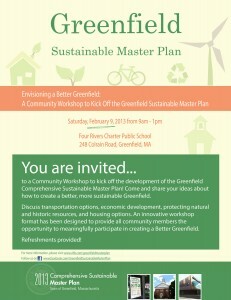 You can check http://greenfieldmasterplan.com/ or http://townofgreenfield.org/ for any changes in the schedule. If you’ve told anyone about the Workshop, please help spread the word. Thanks! And here’s hoping to see you this Saturday! Check out Fostering Art & Culture’s January Buzz event, this Wednesday evening, January 30, 6 p.m. at the Arts Block! One item on the agenda is discussing how to convince town governments to match local cultural council grants. From FAC: Learn about the how we, in Franklin County, can increase resources for arts and culture in our communities and country. MASSCreative aims to highlight ways in which communities, organizations and individuals are having an impact and inspiring positive change in Massachusetts. What actions can we take as artists and citizens to make this change? Join us in finding out more and taking action with MASSCreative and other artists in our region. · What do you appreciate about Greenfield? · What areas need improvement? · What do you want Greenfield to look like in 10 years? 20 years? Envisioning a Better Greenfield: A Community Workshop to Kick Off the Greenfield Sustainable Master Plan will be held on Saturday, February 9, 2013, 9:00am – 1:00pm at Four Rivers Charter Public School, 248 Colrain Road, Greenfield, MA. An innovative workshop format has been designed to provide all community members the opportunity to meaningfully participate in creating a Better Greenfield. Refreshments will be provided! The Greenfield Gateway Sculpture Project announces its first competition for sculptures designed to welcome visitors and residents to Greenfield. Over the next four years, the Project plans to site four sculptures in key areas around town. The first sculpture will be placed on Deerfield Street on the open area near the corner of Meridian Street in fall 2013. 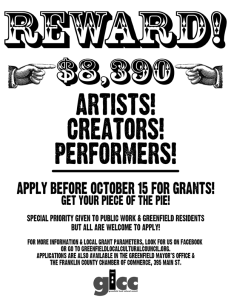 The Project is open to all Western Mass artists. Applications, including 2 or 3 dimensional models of the planned sculpture, are due on February 4, 2013. 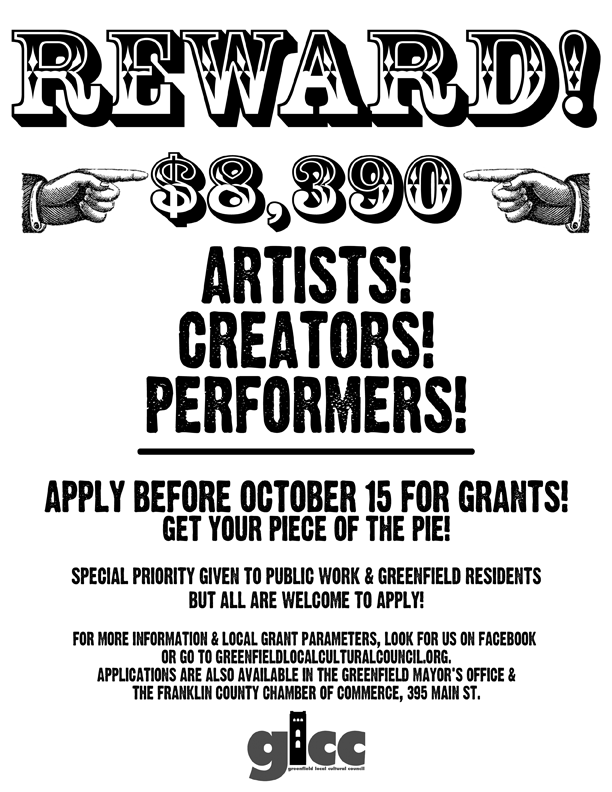 The call to artists is here or by contacting Susan Worgaftik at suworg@comcast.net. The community vote will take place during March, 2013. The winning sculpture will be announced on April 20, 2013 at the little e (formerly the Green Fair and Home Show) at the Franklin County Fairgrounds. For more information, contact Susan Worgaftik at suworg@comcast.net.